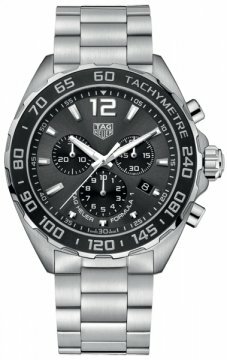 Buy this new Tag Heuer Formula 1 Chronograph caz1011.ba0842 mens watch for the discount price of £1,402.00. UK Retailer. Brushed Stainless Steel Case & bracelet. Anthracite grey dial with black subdials. 1/10th of a second counter sub-dial at 6 o'clock. 30-minute counter subdial at 9 o'clock. 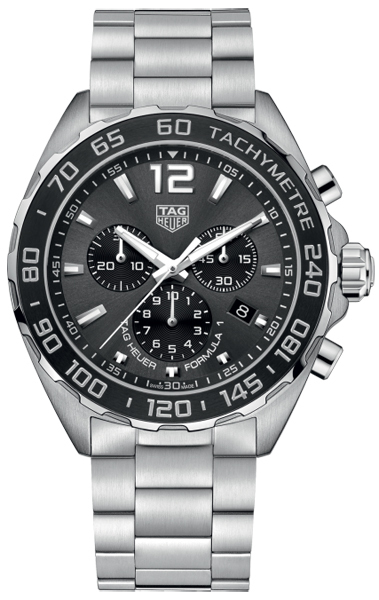 Small seconds hand sub-dial at the 3 o'clock position. Date window located at the 4 o'clock position. End of battery life indicator - the seconds hand will jump every four seconds.